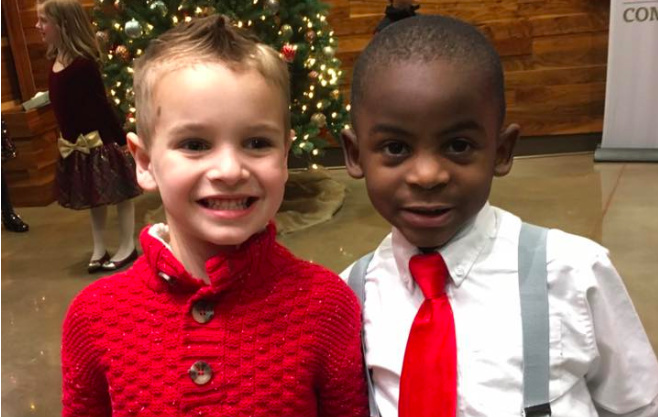 A mother’s post about her son and his best friend is proof that five-year-olds see the world through perfectly honest eyes. American mother Lydia Rosebush recently posted a Facebook photo of her son Jax with his best friend Reddy. The reason? Five-year-old Jax needed a haircut. But he didn’t want just any old haircut, he had a plan: he wanted to shave his head, just like his friend Reddy. That way they’d look exactly the same, and their teacher wouldn’t be able to tell them apart. Hilarious right? Here’s Jax on the left (pre-haircut). And that’s Reddy on the right. Aren’t they cute? So off Jax went to the hairdresser. And of course, he was right on, because in his eyes, they do look exactly the same with their close-cropped hair. It’s a beautiful point. And one that is so relevant right now, with our news channels crammed with stories of intolerance and division. Fittingly, it took one thoughtful five-year-old to teach the world a few things about love and acceptance – that ‘difference’ is all in the eye of the beholder. The post has since been shared over 105,000 times, and has received over 222,000 likes. The story has even been picked up by local and international news publications. Lydia is still reeling from all the attention, telling one media outlet it had just started as a post about her cute kid. She also added that when Jax and Reddy went back to school, their teacher happily played along and got the two boys confused. Looks like Jax’s plan turned out perfectly. How beautiful is this little guy? Tell us what you think.